These were the three questions Andrew guided us to contemplate during our first day long meditation retreat at Sarana Springs this past weekend. I was invited to slow down, looked inward, and I pause. What came to me as I practiced was really sitting with our Young Adult Relational Mindfulness Program, or YAP. I was reminded of the significance of this program. I was reminded that mindfulness practice is necessary to meet inner and outer challenges with compassion. 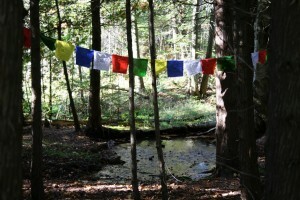 I felt the power of YAP stirring in the stillness of my meditations throughout the day. I held in my heart the young adults we have yet to meet, and those I had the privilege of learning with last year. Andrew asked us to pause deeply with this question. I invoked a myriad of memories and sensations. I come from the grandfather rock that was standing before me. I come from my lineage and ancestors. Every insight, struggle and triumph in my life rang up from my center. One of the things that was rekindled within me was the need to build more community, to bring more youth and young adults onto the land of Sarana Springs – a 171 acre natural refuge that I’ve had the privilege to call a home and share with many of you through past gatherings. I felt a very strong call. 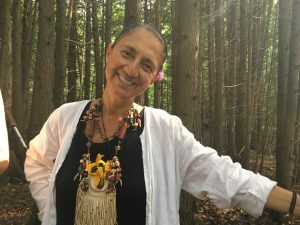 I reflected on my fellow elders, my mentors, teachers, and the legacy of my late husband, Alido Di Diorio, whose life has inspired the manifestation of this land that is here for us to walk on today. You can read more about our early beginnings here. I found myself asking for guidance in the direction of YAP and how to put the call out that this place of natural refuge is here for them. I feel our young adults are in such need for support, whether we all realize it or not. We lose track of who we really are. There is a lack of awareness of in everything we do. How do we pause and look into ourselves? Joanna Macy says, “we go about life, business as usual”. 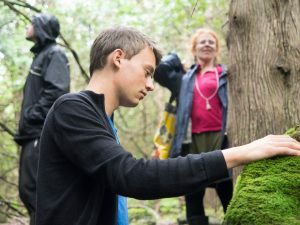 YAP is about connecting to the natural world, and deepening our connection with ourselves, each other and the planet in whole. It is a retreat for the senses and spirit, and it also touches into some very deep inner and outer terrain that expands the capacity for self reflection. I could not help but feel captivated by the thought, impact and potential of this program as I stood gazing over the upper ridge during our morning nature walk. Andrew asked of us to ponder this when gazing out over a ravine. I don’t have an answer, and the unknown also felt safe and spacious. I only know today. And today will inform tomorrow. What I was reminded of though, was this calling inside of me as old as the earth itself. 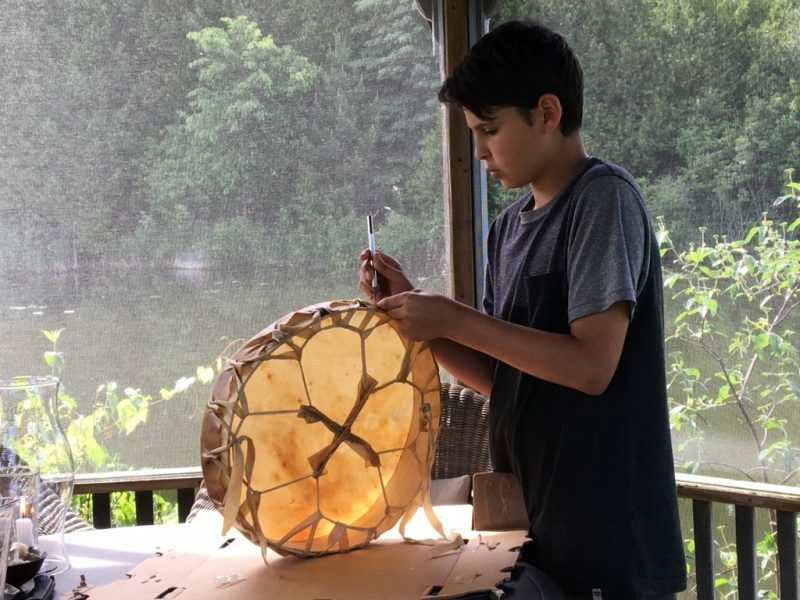 Calling out for the creation of community in natural spaces, for the need for cultural honouring around transitions and challenges, for active reverence and engagement with the earth, and the importance of inter-generational relations in sustaining healthy, vibrant communities. 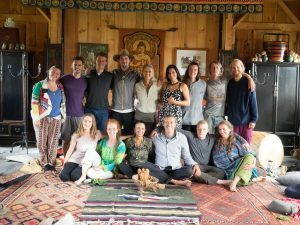 where we hold retreats and programs, is my source. And my practice is also my source. The land, my outer support, and my willingness to explore and maintain my practice is what sustains me. It is easy for our deepest intentions to get buried in the day to day flurry of activities. What a blessing it was to have the opportunity for stillness and reflection on these questions. These open ended up questions had a way of opening me up to a full circle calling, and to deeply remind me of my intention for being here. 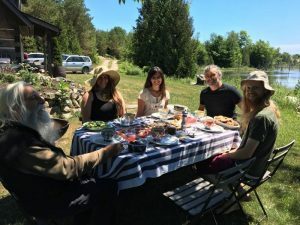 These questions spoke to my roots, from past to present, and echoed out a hopeful calling into all future generations who we may come to know and serve on the land and through Sarana Institute. We are here to support and serve this reflective dialogue. Sarana Institute facilitates spaces for compassionate inquiry. For all community. From youth to elders. Please help us grow the young adult program. Share with anyone you know who could benefit. Donate to increase our scholarship capacity. May we all feel the ripples of every intention brought forth from the most truthful callings of our hearts. This past week was special for so many reasons including the day long retreat. 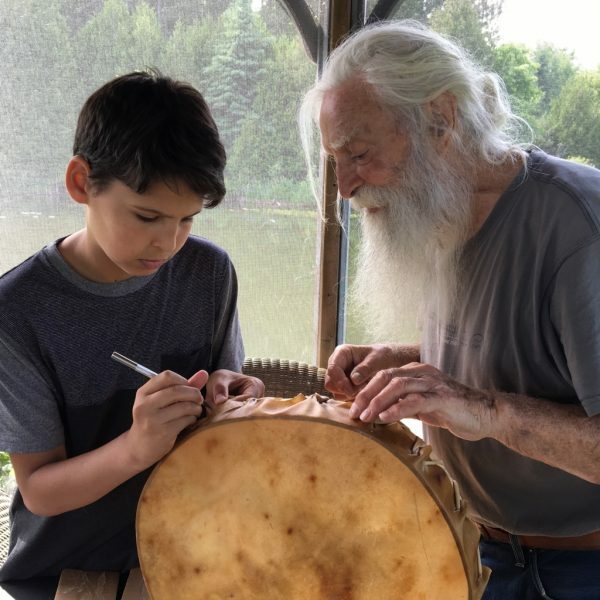 We also created some sweet memories the land with Donato, one of our community elders, guiding a young adult through the process of his first drum making ceremony. 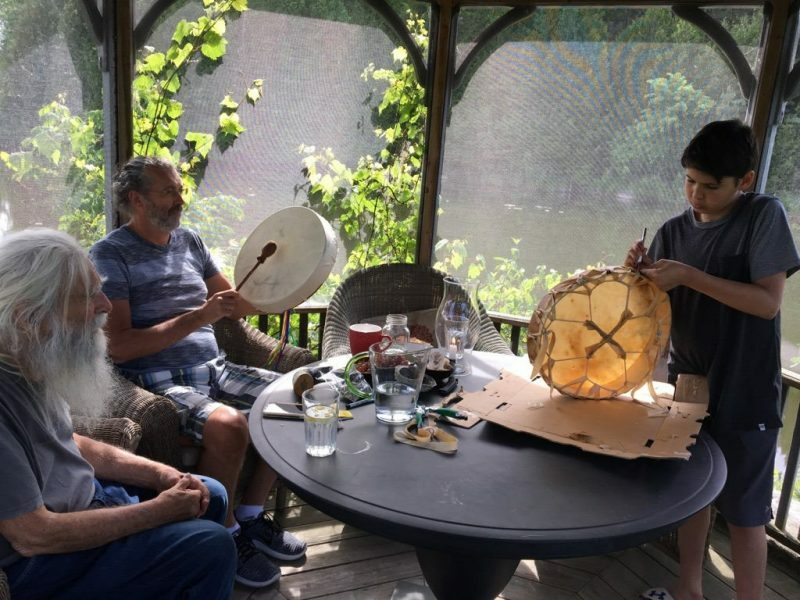 Donato, Andrew and Theo in the drum making process! « Want to grow your inner leader? Nature is your guide!